Casino roulette uses the same basic rules and procedures in all casinos throughout the United States and Canada, as well as in the Caribbean and other island gaming resorts on the North American continent. A roulette table can seat up to 6 players. Each player is given their own colour roulette chips, this enables the dealer to identify who made a winning bet and pay off the correct player. The chips generally have a set value of 25 or 50 denominations, dependent on the currency you are playing in. A stack of twenty 25-cent chips is valued at $5.00, and a stack of twenty 50-cent chips is worth $10. Usually it takes a minimum of $20 to buy-in at the roulette betting table. In roulette betting, a player may request whatever value he wishes for his chips, above the 25 cent or 50 cent standard amount. The dealer will specify the worth of that particular coloured chip by mating a sample chip which is placed upon the rim of the wheel. Players may also bet larger amounts by using $1, $5 and $25 regular. It is important to note that these roulette chips must be cashed in at the table. They may not be removed from the table when the player leaves. The betting layout starts with numbers 0 and 00 at the top, then extends from numbers 1 through 36 at the far end of the table. This area is referred to as the "inside" betting area. Inside bets consist of the following: single-number bets, including the 0, 00 and 1 through 36, are made by placing your chip in the centre of the number you select. If that number wins you'll receive 35 to 1 for every chip you have bet. Actually, you can pick up a total of 36 chips which includes your original bet. Additional combinations in this "inside" betting area are: one chip on a six number bet (pays 5 to 1); one chip on any four connecting numbers (pays 8 to 1); one chip on any connecting group of three numbers (11-1); one chip place between two connecting numbers (17-to-1). For outside bets, the dealer will lay your winning chips alongside your original bet. It is up to you to pick up both your winnings and your original bet after the payoff. All inside bets are paid by the dealer, directly to you. As mentioned. The dealer knows you are the winner by the colour of your chips. In many instances, more than one coloured chip is on a winning number. Again, your original bet is left on the number or combination of numbers and it is up to you to reclaim that bet. Naturally, you can let it ride again on the next roll or even add other chips from your winnings. The perfectly balanced roulette wheel consists of 38 identical slots, individually numbered from 0, 00, 1 through 36. In total, 38 numbers are represented on the betting layout. Each game begins when the dealer (sometimes called croupier) spins the wheel in one direction, and then rolls a little ivory ball along the inner edge of the wheel in the opposite direction. As the wheel turns, the ball loses momentum. It bounces among the slots and finally falls into one of the numbered slots. That number is the declared winner for that game. Incidentally, there are about 90 spins or games played per hour, on average. You will notice on our illustration of the standard roulette wheel that the numbers are not consecutively arranged around the wheel. By design, they alternate between red and black and exactly opposite each other number is the corresponding higher and lower number. Run a ruler or any straight edge across the diagram and you will see that the O is opposite the 00, 1 is opposite the 2, and so on up to the 35 being directly opposite the 36. All red numbers are opposite the black numbers. The house edge is set at 5.26%, resulting from the player receiving odds of 35 to 1 rather than the true odds of 1 in 36 or 37 to 1. All in all, that edge is comparable to the "rake" in poker, and in some bets on the craps table, in baccarat and other games including sports betting. 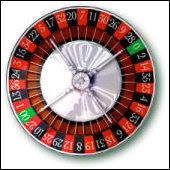 The single-0 European roulette wheel has a house edge of only 2.70%. The player has a 1 in 37 chance of winning and still gets 35 to 1. Some casinos use the en prison rule where, when a zero or double zero occurs, all even- money bets are help (or only one-half taken) depending upon the outcome of the next spin.